It has been puzzling the Midland Railway Society, can we help ? Location is Crewe and photographer is Will Whitworth. 353 is a renewal completed in 1923, but was finished in Midland livery. The roof boards are Liverpool Lime Street Yarmouth & Lowestoft. The end of the next carriage can just be seen and could be a dining car. What was the train, time, make up and route? Was the Midland power normal or was the effectively new engine allocated to the Western Division? The train is shown in my July 1927 Marshalling Circular as the 10.00 MFSO Liverpool Lime Street to Lowestoft. This train was not running in 1922, but I cannot say when it commenced. The train conveyed a 65ft 0in composite dining car throughout. The train also conveyed a through carriage from Liverpool Lime Street to Norwich, and at Uttoxeter two coaches from Manchester to Cromer and another two from Manchester to Lowestoft were attached. At the head of the train were four coaches from Liverpool to Birmingham, which have been detached before the photo was taken and joined to yet more carriages from Manchester. The return time from Norwich/Lowestoft was 10.30, again conveying portions for Manchester detached at Uttoxeter. The first carriage is a 50ft 0in x 8ft 0in arc-roof BTK to D.317 (a late conversion), the second is a 57ft 0in x 9ft 0in corridor composite to D.131. The dining saloon is indeed just visible, but the order of marshalling differs from the 1927 schedule. I am guessing that the engine is working back to its home shed on the Midland Division, perhaps Leicester? There seems to be no further mention, apart from a note in the September issue on p253 explaining that the express between Lowestoft & Cromer and Liverpool & Manchester is composed of WCJS stock throughout, and is worked by the M&GNJ engine No 53 beyond Nottingham. I find this very hard to believe! Yes, it surprised me too, but that's what the Loco Mag says, and there is no retraction or correction in the next three months. "Composed of W.C.J.S. stock throughout" can hardly be a misprint, so - if true - maybe it was just one of the unlikely things which happened in very early LMS days, like this Midland engine being shedded at Edge Hill and taking over from a Jubilee. 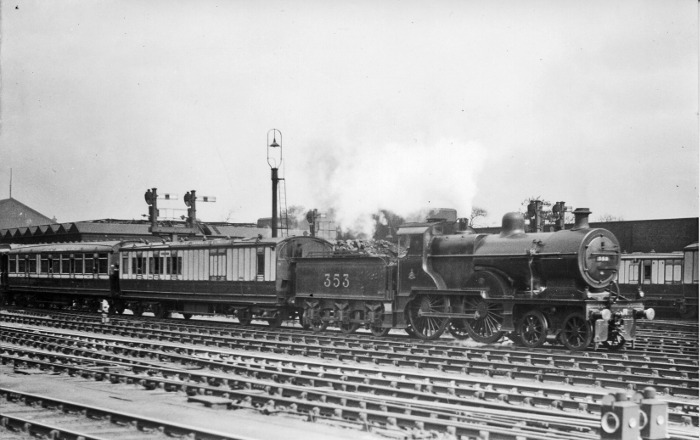 On second thoughts, the WCJS technically ceased to exist at the grouping, as the LNWR and CR were now in common ownership � although carriages in WCJS livery and insignia could be still be seen for a several years. So after the grouping it was no longer necessary to assign WCJS stock to the pre-1923 carriage working schedules. So I accept that it is indeed possible that WCJS-liveried carriages might appear on the Liverpool - Lowestoft service. But I would still be very surprised if all the carriages in the train were WCJS. The ones in the photo are definitely LNWR. Good detective work by Philip and Harry! As regards WCJS, I would have thought that one of its most important features was that it was dual fitted. Unless the LMS immediately started using VB engines on all trains between Carlisle and Glasgow (etc), or found dual fitted stock of similar quality from somewhere else - each of which I would have thought unlikely - then the WCJS stock would have been needed on Anglo-Scottish trains for a while longer! Also, MRS Journal No.59 has this photo included as an unidentified location. I will tell them (in case no-one else does) that it's Crewe in 1923, and give a link to this web page. Reg makes a very good point regarding dual brakes. It may be worth noting that on the eve of the grouping (October 1922) it was agreed that 152 modern LNWR vehicles should be transferred to the WCJS, and 152 vehicles of the old stock currently running should be withdrawn and used by the LNWR for secondary services. Wolverton works order No.912 of November 1922 authorised the conversion of 22 LNWR corridor brake firsts to brake composites “for the West Coast Joint Stock”. These were D.126 and D.127. So it is possible that by mid-1923 the older arc-roofed WCJS vehicles had in fact been replaced by LNWR carriages, enabling the WCJS carriages to be cascaded to other services. But I still find it hard to believe that the train in question was made up entirely of former-WCJS. See also page 43 of LMS Locomotive Review Volume 1 (Essery and Davies) where it states that the service began on 9th July 1923. The engine in this photo is a Jubilee 4-4-0 No.1923, “Agamemnon”, but the stock is certainly not ex-WCJS. See also the replies to Mystery No. 39. Can I please follow up on Philip's fascinating info about the transfer of "152 modern LNWR vehicles" agreed in October 1922, and about W.O. 912 of the following month? The four D127 First brakes were built in 1906 for Irish Day Express sets (2) (in service by July 1906) and in 1905-6 for two of the Euston - Manchester set trains (2) (in service by October 1906). The twenty D126 brakes were built in 1906 for Euston - Wolverhampton sets (9) (in service by October 1906) and in 1907 for Euston - Liverpool /Manchester sets (11?). They were running in these forms in the July 1910 Marshalling Circular, along with their high-roof equivalents (D125). No doubt they still were in 1912-13, but I haven't yet checked those Marshalling Circulars. All these sets/vehicles were VB only (as shown in the 1915 diagram Book) - no need for Westinghouse brake on any of these services! These sets were probably re-arranged and/or disbanded as a result of the mayhem caused by the Great War service alterations and rationalisations. In fact, the sets running post-war are identified in a list dated 1920 in the Archive, which seem to utilise the more modern high-roof stock on the best services. So in 1922 the D126 and D127 BFKs were probably running on less important services and/or "loose" as spare stock. Thus they would be available for transfer to the WCJS. Can it be confirmed that they were fitted with dual brakes under W.O. 912? Can anyone deduce (or guess) what comprised the other 130 LNWR vehicles authorised for conversion and/or transfer? Are there any other relevant Wolverton W.O.? Returning more directly to the subject of the Mystery Photo, the chronology establshed by Ted, Philip and Harry seems to be: 9 July 1923 - commenced running with "Jubilee" 4-4-0 and LNWR stock cAug 1923 - worked by ex-MR 4-4-0 353 stationed at Edge Hill cSep 1923 - formed of ex-WCJS stock throughout (until when???) so maybe this photo was taken in August 1923? If later, it must be after the train reverted to LNWR stock (if/when that happened). The train in the photo is just the Liverpool to Lowestoft portion, of course. 4 vehicles? The two coaches visible are quite late products, the D317 converted in c1912 and the D131 built some time after 1914. The Liverpool to Norwich TC (if running at that date) must be at the rear. All the info I have is given in �A Register of West Coast Joint Stock� Page183. Naturally any conversions of LNWR stock for use in Scotland would need to be fitted with the Westinghouse brake. The brake thirds of D.317 were conversions of D.316. Six were authorised in 10/16 for Liverpool-Newcastle services, and another 30 authorised c.1920 under W/O 692.